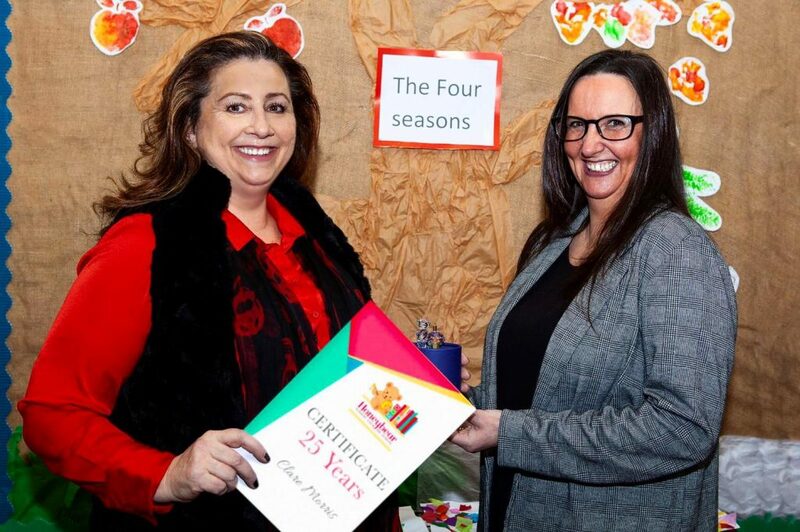 This month Clare Morris is celebrating 25 years as a member of the team at Honeybear Nursery & Pre-School in Whalley Range. The Nursery & Pre-School, which this year celebrates 30 years, was founded by Bernadetta Devine. Bernadetta commented: “Honeybear’s approach, is the same as it was when I opened the first Honeybear Nursery in Whalley Range 30 years ago. It is to provide nursery and pre-school care within a homely and caring environment, whilst still focusing on helping the children develop to their full potential. “Having passionate and caring team members is essential to delivering this approach. When Clare joined Honeybear 25 years ago, she had this in bucketfuls – and still does. She has delivered all of the different roles within Honeybear, which enables her to manage the Whalley Range Nursery & Pre-School with real knowledge and enthusiasm.